Quality, comfort and privacy describe 506 Wind Flower Drive. 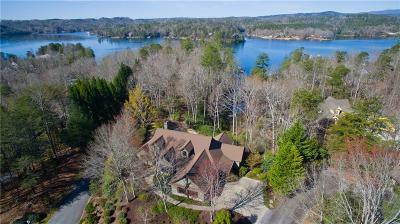 Located in the South section on a double lot, this waterfront home enjoys a park like setting due to discerning landscaping and lush native mountain laurel. The homeâs exterior blends low maintenance fiber-cement siding and Tennessee fieldstone with cedar beams, gable accents and rough sawn shutters. Entering the great room you are greeted with a blend of rustic charm and modern sophistication. Key elements of this room are its cherry flooring, corner stone fireplace, vaulted ceiling with beam gables, clerestory windows and built-ins. The spacious kitchen is anchored by a sizable leathered granite island, cage lighting, and gas cooktop with downdraft. Antique mirror fronts accent the custom cabinetry while premium appliances and butlerâs pantry satisfy the epicure. A sizable covered deck, grilling terrace and screened in porch merge with the interior allowing for seamless entertaining and alfresco dining while enjoy lake sunsets. The vaulted master suite affords early morning lake views, incorporates his and her walk-in closets opposite a posh bath with double vanities, walk in tile shower and jetted tub. The homeâs main level provides numerous additional spaces: a second bedroom suite, stylish alcove bed, mud room with storage and bench, laundry room with granite counters and cabinetry, and oversized 2 car garage with epoxy floor. The lower level continues the homeâs exacting standards. The family room includes a kitchenette, game table, comfortable seating and adjoining wine room. Two additional bedrooms are located on opposite ends of this level, as well as a Vitale table pool room, his and her offices, and a second alcove style bed. Outdoor living areas inspire: choose a game of table tennis or bocce on the lawn or simply relax and enjoy the view. The immaculately groomed path, enhanced by low voltage lighting, suitable for an easy walk or golf cart ride leads to the rip-rapped shoreline and covered dock with lift. SELLER IS A LICENSED SC REALTOR(R).